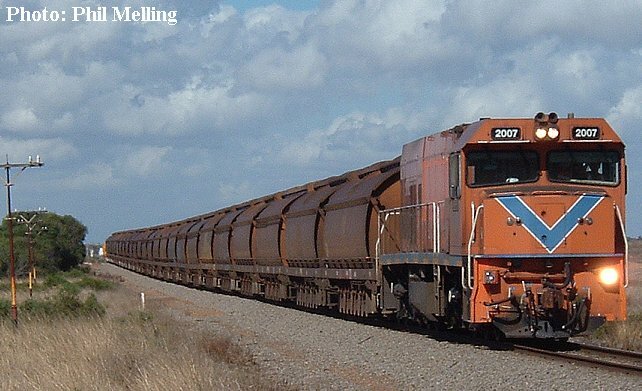 Around the Geraldton area the Australian Railroad Group (ARG) haul more than grain trains. 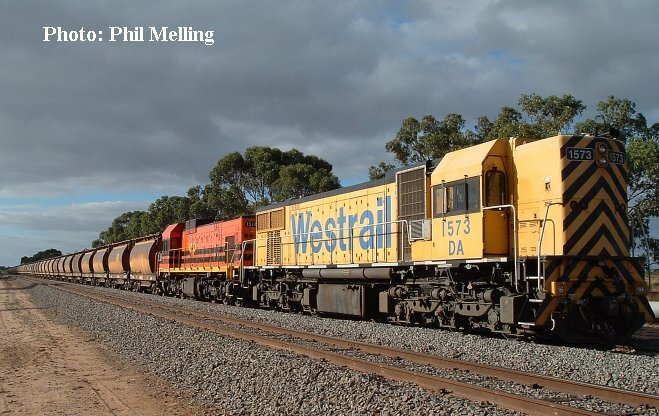 On this page we feature a few other trains that run: Mineral Sands from Eneabba, Iron Ore from Mullewa & coal from Collie. Until earlier in 2004 Talc was also hauled from Three Springs, at this time we are not certain what is happening with the Talc exports via Geraldton Port. 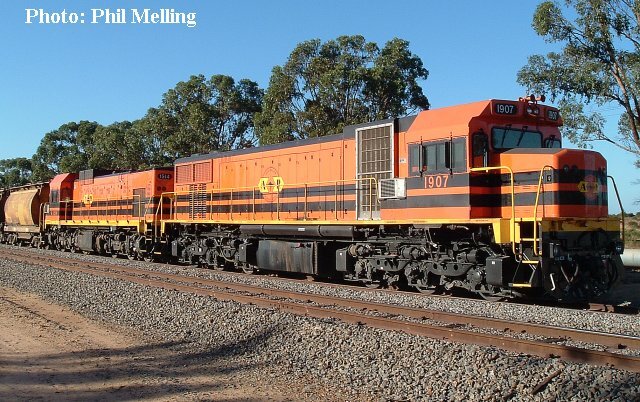 1907/A1514 are seen on the mineral sands train at Narngulu on 25 March 2004. This train is normally hauled by a single P class loco, it was good to see something different. DA1573/P2017 haul an empty iron ore train past the former Geraldton Railway Station on 26 April 2004. The station platform and buildings can be seen in the left of the photo. 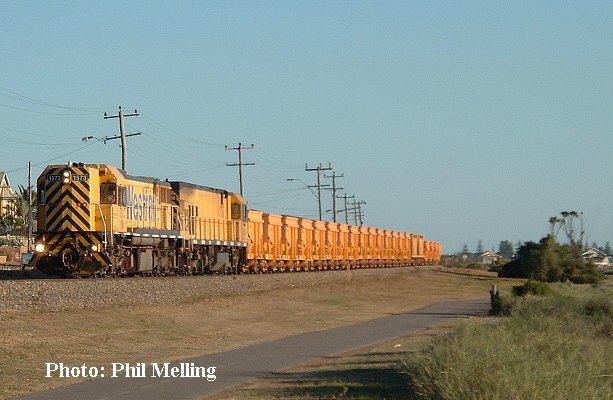 The coal train, P2007 hauls a loaded coal train towards Narngulu on 8 May 2004. 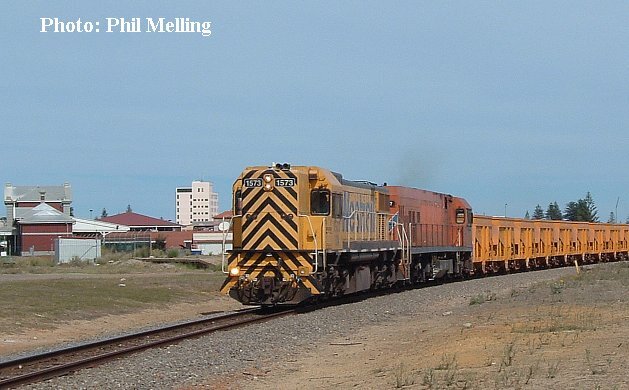 Yellow liveried pair DA1573/P2002 haul an empty iron ore train along the Geraldton Foreshore on 1 May 2004. This section of railway is the last part of the original railway from Geraldton to Northampton which opened in 1879. This railway will close within two years when it is replaced with a new line to the south of the City currently under construction. On the 16 March 2004 DA1573/A1514 were the locos on a loaded mineral sands train.